Can I file my quarterly taxes through Hurdlr? The IRS requires self-employed taxpayers to pay estimated taxes throughout the year if you expect to owe more than $1,000 in taxes after subtracting withholdings from a W-2 job, plus tax credits. If you fit the above description and expect to owe estimated taxes, here’s the good news: you don’t have to complete and file a complicated return each quarter; just make an estimated payment to the IRS either online, by phone, or through the mail before the due date each quarter. Hurdlr’s Tax Engine estimates your projected quarterly payment in real-time, so you don’t have to calculate this on your own. Just make sure your tax profile is complete. The Tax Payments feature allows you to track payments made throughout the year, so you know how much you still owe and how much you’ve paid. 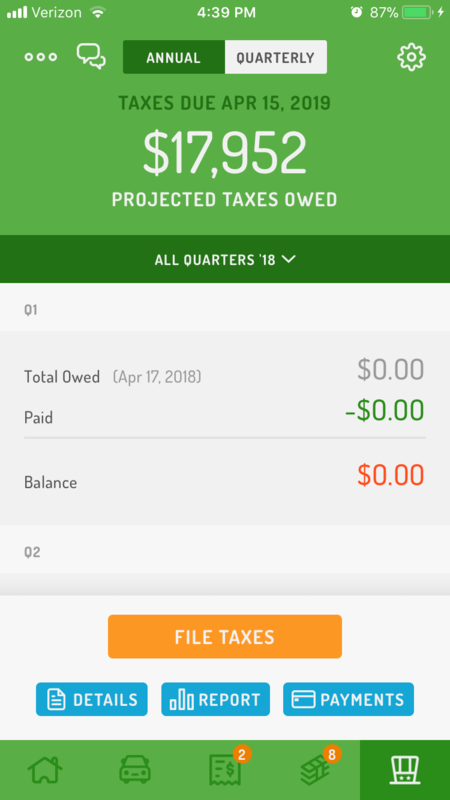 To view your quarterly tax projection, navigate to the ‘Taxes’ tab then tap the ‘Quarterly’ view at the top of the screen. You may also be required to make quarterly estimated payments to your state throughout the year. Since each state has different rules for estimated tax payments, refer to your state’s Treasury or Revenue website for more information.